• This wonderful collection contains some of their best performances – The Clancys were at their best in concert and you can enjoy their witty introductions as well as their songs. 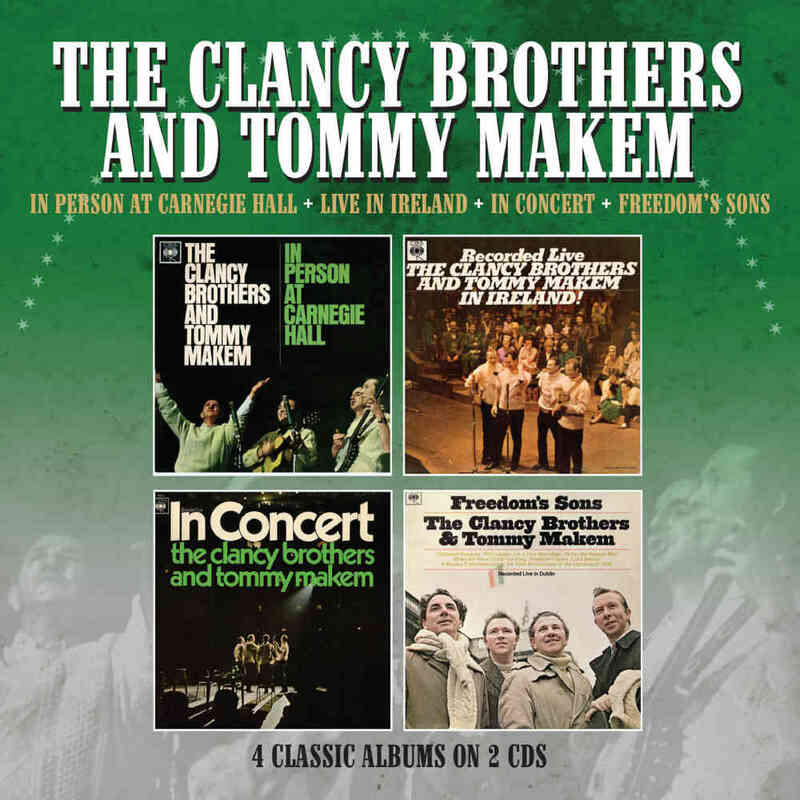 No doubt about it – The Clancy Brothers and Tommy Makem wanted audiences to have a good time. • Their big break came on Sunday, 12th March 1961 when they were booked to appear on The Ed Sullivan Show that had over 50 million viewers. Liam Clancy said, “It not only changed our lives but it changed the lives of the people who made sweaters, as the sale of Arran sweaters jumped by 700% in a month”. • The Carnegie Hall concert included Dominic Behan’s comments on the troubles ‘The Patriot Game’, which inspired Bob Dylan to write ‘With God On Our Side’. • The Live Concert in Ireland includes a tribute to Dominic’s brother Brendan Behan. “I knew him sober and I knew him drunk” said Liam Clancy and his wife said “Oh, you know both of them”. • In this collection there are many rebel songs, sometimes light-hearted, as they joke about the statue of Lord Nelson being blown up in Dublin in 1966. You will also hear The Clancys remembering the uprising of 1916 with words from Irish writers W.B. Yeats and Sean O’Casey. • The Clancy Brothers and Tommy Makem were a major concert attraction and their success encouraged other bands, notably The Dubliners. • These four albums come together for the first time in one collection.